KIEV, Ukraine -- Petro Poroshenko, a pro-Western former foreign minister, on Friday accepted the post of economy minister amid signs President Viktor Yanukovych is trying to repair his government’s worsening reputation at the European Union. Newly appointed Economy Minister, Petro Poroshenko. Poroshenko, 46, accepted the post after a one month-long consideration after Yanukovych – in a highly unusual move - had publicly announced last month plans of making the appointment. Poroshenko has so far been positioning himself as an opposition politician and has appeared several times at street protest actions jointly with Arseniy Yatseniuk, a former speaker of Parliament. “The last couple of weeks were very hard for me,” Poroshenko wrote in his Facebook account hours before the appointment. Poroshenko said he accepted the post for promoting Ukraine’s integration with the European Union, de-regulation of the economy, reducing corruption, making economic policy transparent. 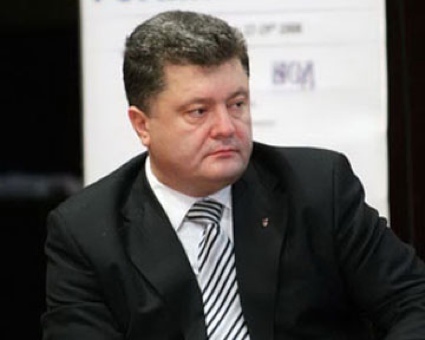 Poroshenko, whose fortune is estimated by Forbes at about $1 billion, owns a number of assets, including the country’s largest confectionary Roshen, and also shipbuilding plant Leninska Kuznia and media assets that include Channel 5 television and Korrespondent weekly magazine. Oleksandr Yanukovych, the son of the president who amassed a massive fortune since his father had become the president two years ago, was recently reported to be interested in acquiring a stake in the Channel 5. Poroshenko is also believed to have good relations with Prime Minister Mykola Azarov, who has been so far losing his influence in the government. Azarov’s closest ally, Fedir Yaroshenko, was dismissed the finance minister in January. Among immediate tasks that Poroshenko will have to deal with is the government’s attempts to resume the $15.5 billion loan from the IMF. The government, facing a deadlock with the IMF, was recently reported have hired a U.S. lobbyist firm to try to get the money. The letter was aimed at helping Ukraine to get around the key IMF demand of hiking natural gas prices for households. The loan was frozen in early 2011 after the government had failed to increase by 50% natural gas prices for households and utility tariffs to balance the budget.